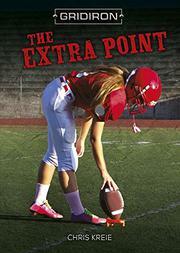 A high school senior cut from girls’ soccer becomes the football team’s new kicker. Rather than making the varsity team with her best friend (hijabi and star player Aisha), Riley (depicted on the cover as white) finds herself cut from the JV team to make room for younger players. She has the strongest corner kick but isn’t fast enough. She pulls out of her disappointed funk when a call goes out for an open tryout for the football team’s kicker position and—after some practice adjusting kicking mechanics—she goes for it and makes the team. While a girl trying out initially surprises players and coach alike, the characters are all supportive of her, with the exception of bullying star defensive player Sean. Athletic but not a prodigy, Riley struggles with unevenness; sometimes she performs well, but she’s still picking up the technique for consistency. After some tough games—losses for which Sean holds her responsible—she must find her own confidence to play as well as she can. The bullying storyline is never directly addressed or concluded; rather, the focus is on Riley’s internal conflict. Diversity’s present in character names; aside from Aisha, the other prominent secondary character is Chava Gutierrez, the supportive quarterback. Three other titles in the Gridiron series publish simultaneously: False Start, by Paul Hoblin, and The Late Hit and Showdown, both by K.R. Coleman.